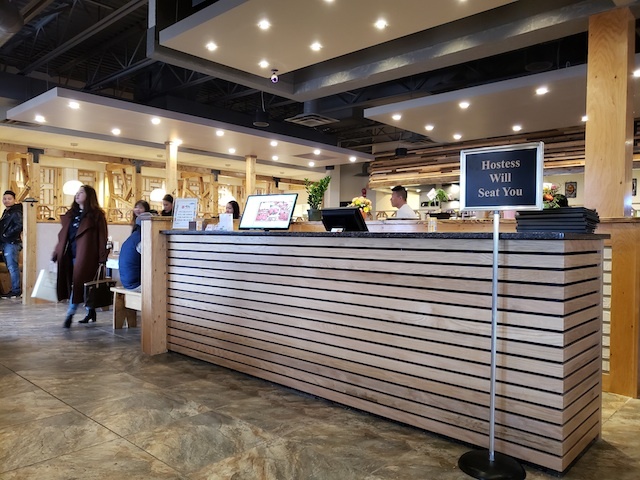 Baekjeong is the newest Korean BBQ restaurant in town, located on Calgary trail where Kobe used to be. They've completely renovated the place, giving it a much more rustic and homey feel. I've noticed that pretty much every table ordered one of the combos because they're very good value. Each combo comes with a selection of 3-5 meats, a soup, and steamed egg. 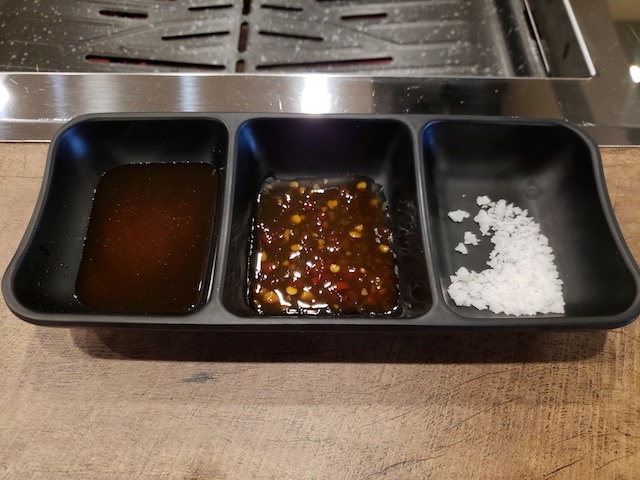 An individual meat entree for grilling costs close to $30 and does not come with any extras, so it's a good idea to get at least one combo and order additional items for sharing. 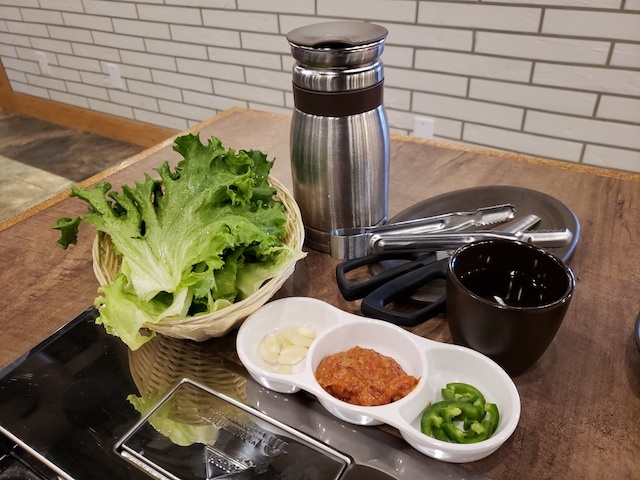 After placing our order of C1 ($85 beef combo for 2-3 people), we were quickly served a complimentary salad and banchan (side dishes) while we waited for our meat. We were also given a variety of sauces and lettuce for wrapping the meat with. The good news is that all of these items are refillable! Yes unlimited salad, side dishes, and lettuce! 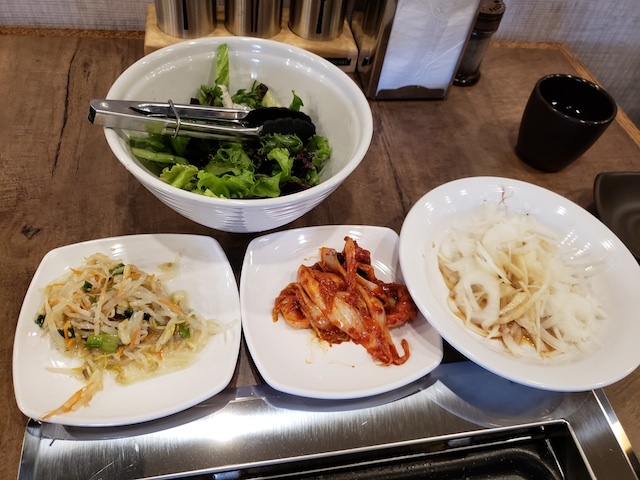 Also just a note that their kimchi is quite spicy, possibly the spiciest one I've tasted. When the meat finally arrived, my first thought was that it didn't look like a lot. Two people could easily finish this! But it turned out it was just the right amount, and it could even feed three people if you throw in a couple bowls of rice. Because there was also the soup, the steamed egg, and unlimited salad and side dishes. 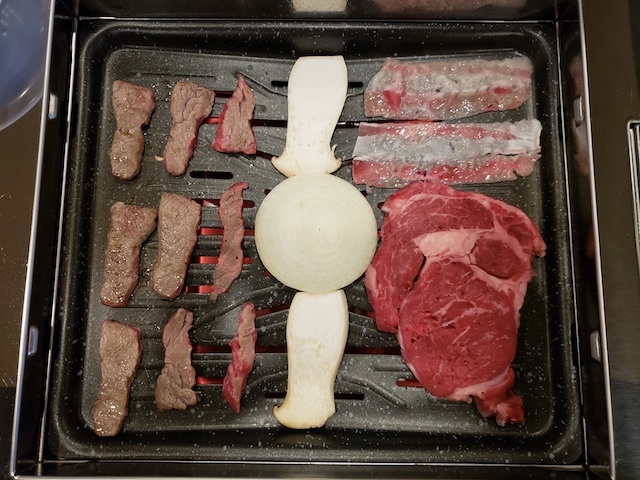 The server told us to put the onion and king oyster mushroom in the middle of the grill, and the meat on the side as shown below. After the meat is cooked to your liking, put it on top of the veggies to prevent overcooking. This worked well for us, but since we left the veggies on the grill the whole time, the underside was burnt and we didn't get to eat the tasty caramelized onion. 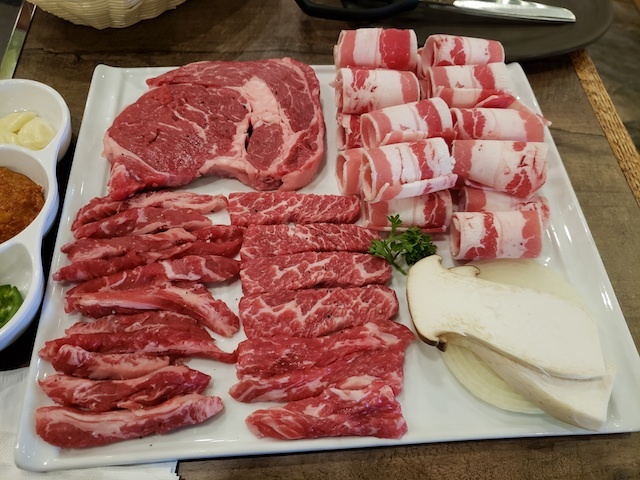 The meat was all very good quality and my favourite cut was the thick sliced prime rib eye steak, followed by the sliced boneless beef short rib. The sliced beef rib finger was difficult to cook evenly due to its irregular shape, and I found the thin sliced beef lower brisket a bit too fat and greasy. Now onto the soup and steamed egg that came with the combo! 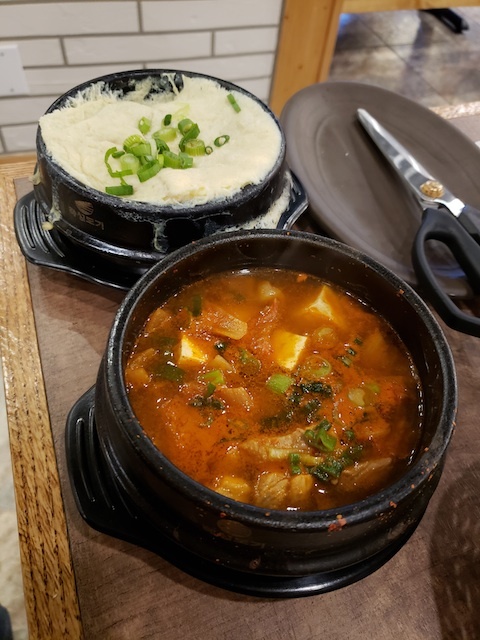 You can choose between Korean bean curd soup and kimchi soup. I went with the latter because of several positive reviews, and it did not disappoint. Although the portion was not very big, the hot and spicy soup definitely hit the spot. The steamed egg was also very good despite its appearance. It was much puffier when it first arrived, but quickly deflated like a souffle. And although it was not burnt, it had a delightfully charred taste to it. 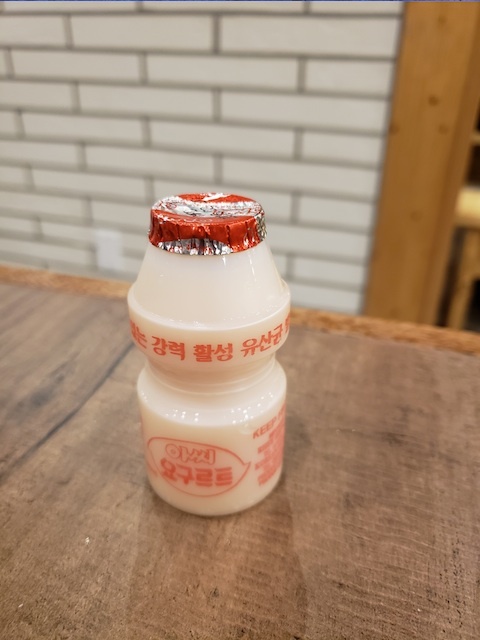 The bill arrived with a complimentary yogurt drink! A very thoughtful treat to help with digestion after all that meat. 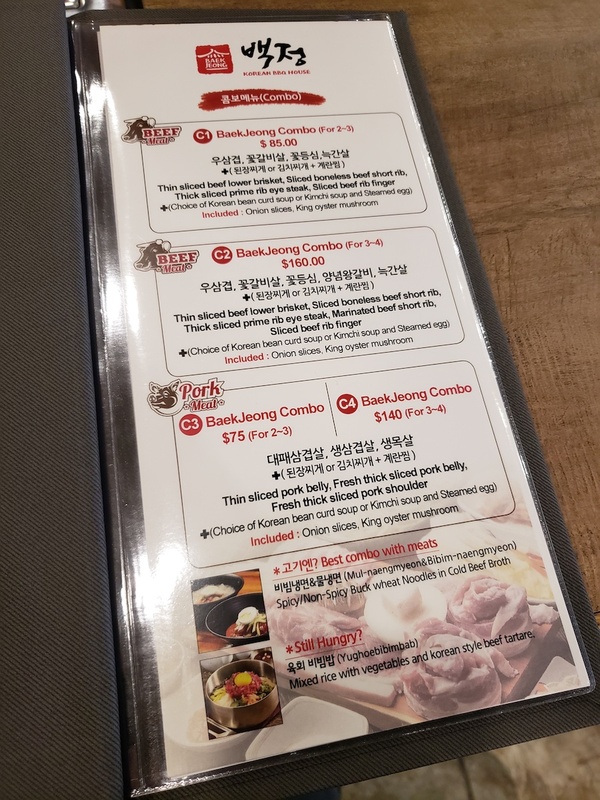 This is definitely a place I'd come back to, especially with a bigger group to try some of the individual entrees or other non-BBQ dishes on the menu. It would be the perfect venue for a casual group gathering or special occasion.